I had to make an emergency run to the garden center today because I realized I didn't have any 'Green Arrow' peas to plant. I plant peas on St. Patrick's Day, always. Well, always for the past ten years or so. And always 'Green Arrow'. And then they didn't have 'Green Arrow' at the garden center I went to. So I bought 'Wando' and 'Provision #9'. Then I remembered I had a small packet of 'Green Arrow' at home after all. But was it going to be enough? I went to another store and they had 'Green Arrow' peas so I bought two packets. That's at least one packet more than I need but I bought them just because I was so relieved to find some. 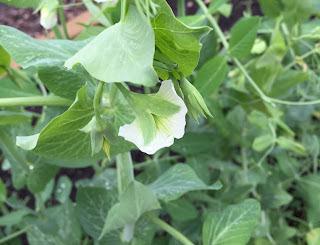 Plus, I am speaking about vegetable gardening to some Master Gardeners in O-hi-o and I wanted to have some 'Green Arrow' pea seeds to give to them. Give peas a chance and all. Did I mention it was pouring down rain when I woke up this morning? It was. But I didn't think for one minute that the rain would stop me from planting peas. I have raised beds in The Vegetable Garden Cathedral so I knew I'd be able to plant sometime later in the day. Then I was at the grocery store mid-early-afternoon when I got a text from my older sister. She was reporting in that she had just planted her peas. I took a few breaths to keep from hyperventilating at the thought that daylight was running out and I wouldn't have time to plant my peas and my sister had planted hers. Then I remembered daylight savings time started last Sunday and we now have plenty of daylight around here. Finally I returned home, put the groceries away, changed my jeans and went out and sowed peas. Five kinds of peas. 'Green Arrow', of course, because that's the variety my Dad always planted. 'Wando' and 'Provider #9', the back up varieties I bought when I thought I didn't have 'Green Arrow'. Plus 'Oregon Giant', a snow pea variety, and 'Bend and Snap', a new variety of snap peas Burpee sent with a whole bunch of other seeds. And earlier last week I planted 'Masterpiece' peas in some containers with violas. That's six varieties of peas around here. I'm giving peas a chance! I am aware, of course, that the phase of the moon is all wrong today for planting above ground crops. It's waning. It should be waxing. I had a notion to plant my peas earlier when the moon was waxing. The soil was warm enough. But tradition. St. Patrick's Day. So as an experiment, I'm going to plant another short row of 'Green Arrow' peas when the moon is waxing again, after March 27th, and then compare those peas with the ones I planted today. And thus a new season begins in The Vegetable Garden Cathedral. We always plant peas when we hear the peepers peeping. Do you have peepers there? They're a kind of frog. St. Patrick's Day is always too early for us, even when we don't have 3 feet of snow on the ground, which we do. Well, maybe it's 2 and 3/4 feet now; some has melted. Home vegetable gardens are turning out to be increasingly prominent these days. This is a direct result of their various advantages and simplicity of support. Think about some vital advantages of home vegetable gardens , which will give you an all the more clear picture of them.